I’m sure you’ve heard the term “superfood” and maybe you’re tired of hearing that word because now it seems like everything is getting labeled a superfood. So, what does it take to get that label? The definition of a superfood is a food that is rich in compounds (such as antioxidants, fiber or fatty acids) considered beneficial to a person’s health. Cabbage is from the cruciferous family of vegetables, this also includes cauliflower, Brussels sprouts, kale, and broccoli, to name a few. This family of vegetables is notorious for being loaded with beneficial nutrients. If you’re trying to improve your diet, cruciferous vegetables are a great place to start. Cabbage comes in many varieties. Green and red cabbage, Bok Choy, Savory and Nappa cabbage are the most common types found in grocery stores. Cabbage is one of the most economical vegetables. It’s inexpensive, stores well, and is available throughout the entire year. When trying to pick the best cabbage look for heads that are tightly packed, heavy, and vividly colored. A whole cabbage will keep in the refrigerator for up to two weeks, and five or six days when chopped and stored in an airtight container. Cabbage is known to accumulate a build-up of cadmium-binding complexes in its leaves and one of the main components of that is glutamine. Glutamine is a strong anti-inflammatory agent. Consuming cabbage can reduce the effects of many types of inflammation, irritation, allergies, joint pain, fever, and various skin disorders. One of the most celebrated health benefits of cabbage is its powerful antioxidant quality. These antioxidants search out and find free radicals in the body. Free radicals can be detrimental to overall health and are major contributors to cancer and heart diseases. Cabbage also has a number of anti-cancer compounds, like lupeol, sinigrin, and sulforaphane, which are known to stimulate enzyme activity and inhibit the growth of tumors that lead to cancer. Research over the past 30 years has shown that consuming cruciferous vegetables is associated with a lower risk of cancer. Red cabbage is chock full of anthocyanins, a type of antioxidant commonly found in blue, purple, and red plants. Studies show that anthocyanins slow cancer proliferation, kill already formed cancer cells and stop the formation of new tumor growth. The presence of vitamin K along with anthocyanins can give a strong boost to mental function and concentration. Vitamin K is essential for the production of sphingolipids, the myelin sheath around nerves, this sheath protects nerves from damage and decay. Therefore, consuming foods rich in vitamin K can improve your defense against neural degeneration, Alzheimer’s disease, and dementia. Cabbage is also rich in iodine which aids in the proper functioning of the brain and the nervous system. The same anthocyanins that help protect against cancer also protect against inflammation that can lead to cardiovascular disease. The potassium in cabbage also makes it a wonderful way to protect from elevated blood pressure, which increases the risk of heart attack and stroke. Potassium is a vasodilator, which means that it opens up the blood vessels and eases the flow of blood, so it isn’t being forced in a stress-inducing way through constricted arteries and veins. The high content of vitamin C and sulfur in cabbage act as detoxifiers to purify the blood and remove toxins, primarily free radicals, and uric acid. Both of which are the main causes of rheumatism, gout, arthritis, renal calculi, skin diseases, and eczema. Recent studies have shown that dietary fiber may even play a role in regulating the immune system and inflammation, consequently decreasing the risk of inflammation-related conditions such as cardiovascular disease, diabetes, cancer, and obesity. Fiber found in cabbage also acts as prebiotics, which feeds the beneficial bacteria in your digestive system. A popular way to consume cabbage is in a fermented form such as sauerkraut and kimchi. Fermented foods are full of probiotics, and might be one of the best things you can consume for your immune and digestive systems. Healthy microbes generate an acidic environment to preserve and develop flavor; the enzymes produced in fermentation also make vitamins and minerals easier for the body to absorb. Take full advantage of this superfood. When preparing cabbage, cook it minimally or not at all. 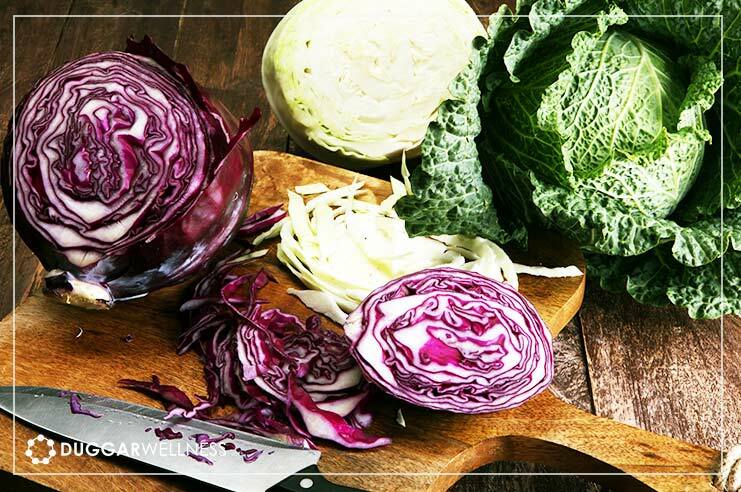 Heat breaks down the chemical compounds that give cabbage some of its nutritional superpowers, so get the most out of every bite by keeping the leaves crunchy. Increase its nutrient absorption and beneficial properties by fermenting it. Add it to almost anything you can think of. Shredded in a salad, or tossed into soup, in place of lettuce on a taco, blend into a smoothie, make some yummy coleslaw or ferment some sauerkraut.